Wednesday's hearing, the fourth of its kind, comes just weeks after Facebook and Twitter discovered and removed hundreds of fake accounts run by Iran. Lawmakers on the committee described the current situation as a major national security threat that must be dealt with in the short-term. "The prospect of that data being shared with shady businesses, hackers, and foreign governments is a massive privacy and national security concern," Wyden said. "The Russians keep looking for more sophisticated ways of attacking our democracy. Personal data reveals not just your personal and political leanings, but also what you buy and even who you date." "My view is personal data is now the weapon of choice for political influence campaigns and we must not make it easier for our adversaries to seize these weapons and use them against us," Wyden said while discussing ways Congress can assist in this issue. Sandberg was not particularly forthcoming about findings in a series of audits outlining how Facebook shares Americans' personal information. Those findings have remained secret, though Wyden is pushing for their public release. "The American people deserve to see this information," Wyden said. "Will you commit to making public the portion of your audits that relate to Facebook's partnerships with smart phone manufacturers?" Several other lawmakers suggested "regulations" for the social media giants to help combat foreign influence campaigns and privacy breaches. "The information your platforms disseminate changes minds, it hardens opinions, it helps people make sense of the world," said Intelligence Committee Chairman Richard Burr (R., N.C.). "When you control that or you influence that, a little of it, you're in a position to win wars without firing a shot. That's how serious this is." "Our goal today is to begin to shape actual policy solutions which will help us tackle this challenge," Burr said, explaining that social media users deserve the right to know who exactly is in charge of their information and how it is being used. Hinting again at greater federal regulation, Sen. Robert Warner (D., Va.) told the leaders, "The era of the wild west in social media is coming to an end." "The bad news, I'm afraid, is there is still a lot of work to do and I'm skeptical ultimately you'll be able to address this challenge on your own," Warner said. "I think Congress is going to have to act." "Why are your terms of service so difficult to find and nearly impossible to read, much less understand?" he asked. Faced with these questions, Facebook's Sandberg said the company was "too slow to spot" Russian meddling and "too slow to act" against it. "That is on us," she said. To help combat this, Facebook has employed some 20,000 people in its safety and security division and is viewing reports in 50 languages "24 hours a day," according to Sandberg. The process is being augmented by "artificial intelligence and machine learning." Facebook is now blocking "millions of attempts to register fake accounts each and every day," she said. The company also is "making progress on fake news" by cracking down on its distribution and demoting "articles rated by third party fact checkers as false," according to Sandberg, who did not describe who these third party fact checkers are. Facebook also is recommending alternate news sources to those users it feels are sharing "fake news." Twitter's Dorsey, reading from a statement on his cellphone that was simultaneously posted to his Twitter account, lamented how his service has been used in recent years. "We aren't proud of how that free and open exchange has been weaponized and used to distract and divide people, and our nation," Dorsey said. "We found ourselves unprepared and ill-equipped for the immensity of the problems we've acknowledged." "Abuse, harassment, troll armies, propaganda through bots and human coordination, misinformation campaigns, and divisive filter bubbles … that's not a healthy public square. Worse, a relatively small number of bad-faith actors were able to game Twitter to have an outsized impact," he continued. Twitter is now removing "over 200% more accounts for violating our policies," according to Dorsey. "We're identifying and challenging 8-10 million suspicious accounts every week. And we're thwarting over a half million accounts from logging in to Twitter every day." 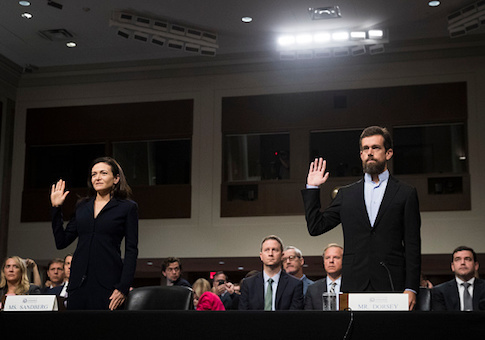 The responses from Sandberg and Dorsey did not appear to allay congressional concerns about how these social media platforms are being used. This entry was posted in National Security and tagged Congress, Facebook, Twitter. Bookmark the permalink.